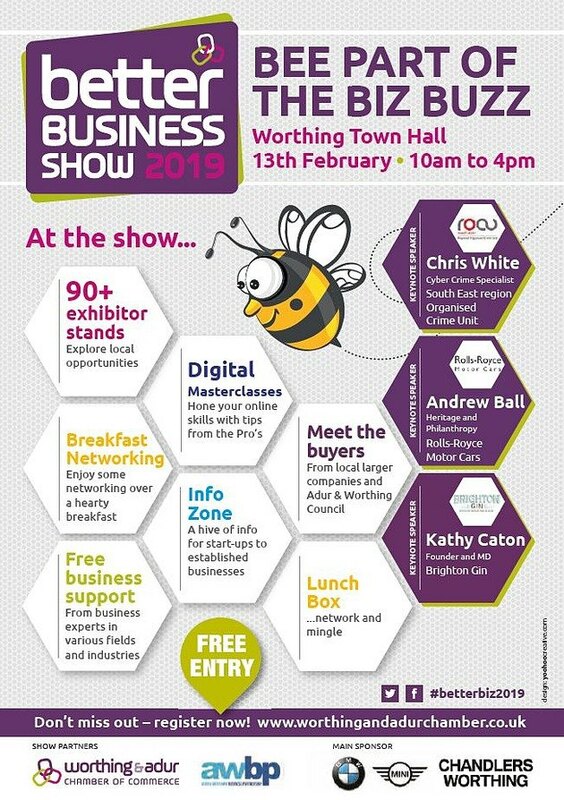 With a strong focus on ‘Buy Local’, this event is a ‘must’ in the 2019 business calendar for ALL businesses in Worthing & Adur, both large and small. Bee part of the buzz at The Better Business Show! • B2B Exhibition - Over 90 stands, meet, network and introduce your business. You’ll find everything from local manufacturing companies, a wide range of professional services, construction companies, health and fitness providers, and caterers offering a great lunch! • Info Zone - A hive of information for start-ups, growing and established businesses including information about grants and finance. Come along and meet the Coast to Capital Growth Hub team and find out what’s on offer. • Be Inspired - Don’t miss the Keynote speakers, they will be sharing their journeys to success. o Kathy Caton, Founder and MD of Brighton Gin, Brighton's first (legal!) distillery, talks about taking the multiple award-winning super-premium Brighton Gin to the city and beyond. • Be Informed - Keep up to date with the latest cyber-crime trends, threats and vulnerabilities. Keynote Speaker Chris White, Police Cyber Security Advisor for the South East Region Organised Crime Unit will guide you through the cyber frauds and scams. • Promote - Meet, network and share experiences at the B2B Exhibition with both new and established businesses. Who knows, you could even pick up some new clients! • Digital Masterclasses – Top tips on Social Media Strategy and Digital Marketing – trust us, you don’t want to miss these! This event is collaboratively delivered by Worthing and Adur Chamber & Adur & Worthing Business Partnership.